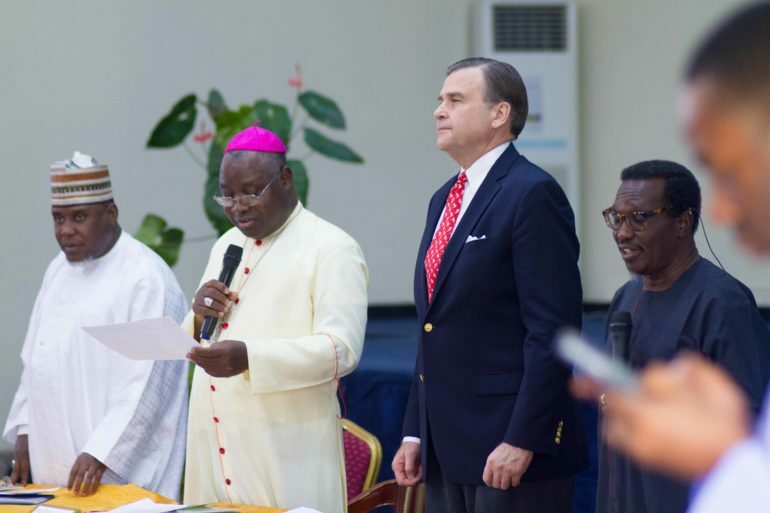 As Nigerians prepare for elections this week, the US Ambassador encouraged religious leaders to “inspire non-violence through their actions”, reports the Nigerian newspaper Daily Trust. Stuart Symington told Christian and Muslim leaders at a roundtable event in the central Nigerian city of Jos last week (6 February) that “it’s about words as much as actions in ensuring the elections would be peaceful, with an outcome that would be accepted by all”. Democracy means “that the citizens are the government, the governor is there temporarily, the citizens govern forever”, he said. The Archbishop of Jos, Rev. Ignatius Kaigama, called on Nigerians to stay away from mixing politics with tribal or religious agendas. Elections should be about who best can serve the common good rather than partisan and personal interests, he said. Religious and traditional leaders have an important role to play in debunking destructive narratives about other religious and tribal groups, said Rev. Gideon Para-Mallam, founder of the Gideon and Funmi Para-Mallam Peace Foundation which hosted the event, which was also attended by the Secretary General of Jama’atu Nasril Islam, Dr. Khalid Abubakar Aliyu as well leaders of Christian and Muslim youth and women groups.